Associations – one-to-many, in a web service. Work on Assignment 2. One to many will be discussed today, and the others in the next class session. a “Manufacturer” has a collection of “Vehicle” objects. a “Vehicle” is made by a “Manufacturer”. // For almost all one-to-many associations, the to-one end is "required"
In a design model class, the collection type will be an ICollection<T>. In a resource model class, the collection type will be an IEnumerable<T>. Remember, whenever you declare a collection property, you MUST initialize it in a default constructor. Important: When you write a statement in code to set one end of the association, do you need to write another statement to set the other end? No. As you know from past experience, AutoMapper is a convention-based mapper. Between classes, it will map/convert properties that have the same name and type. If you have an entity that has an associated object – for example, a Course belongs to an academic Program, or a Product belongs to a Supplier – you may want to return individual properties from its associated object. 1. In a new resource model class, add a property with a type that matches the property in the associated type. The property name must be a composite of the design model class name and the property name, in CamelCase. 2. Add an AutoMapper map (to the AutoMapperConfig class), which maps the design model class to the new resource model class that you created in step 1 above. 3. In the Manager class method, when the code fetches the object, add the Include() extension method to fetch its associated object. You can see more in the AssociationsIntro code example. Look in the Album_vm.cs source code file. If you have an entity that has an associated entity – for example, a Course is associated with a single academic Program – you may want to return an object with its associated object. 1. In a new resource model class, add a navigation property for the object. The type is a resource model class type. The property name must match the property name in the design model class. 2. 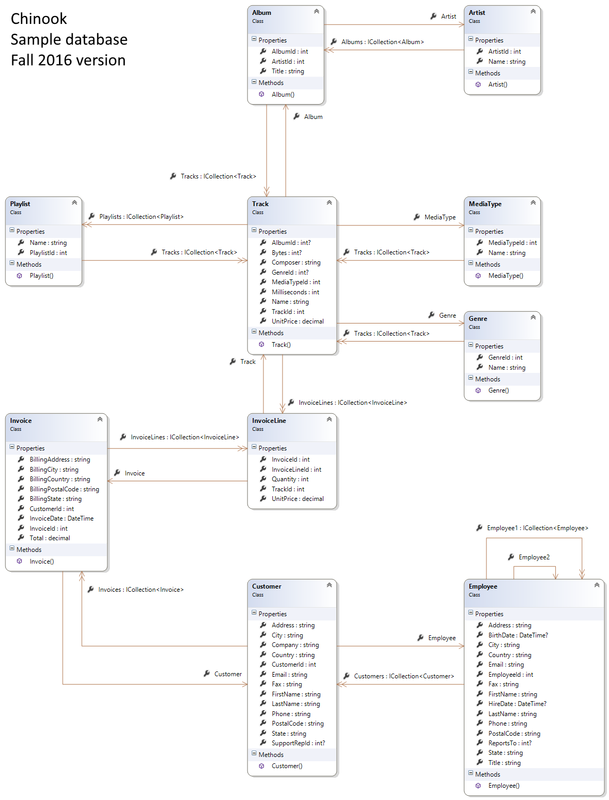 Add an AutoMapper map, which maps the design model class to the new resource model class that you created in step 1 above. If you have an entity that has an associated (related) collection – for example, an academic Program has a collection of Courses, or a Supplier has a collection of Products – you may want to return an object with its associated collection. 1. 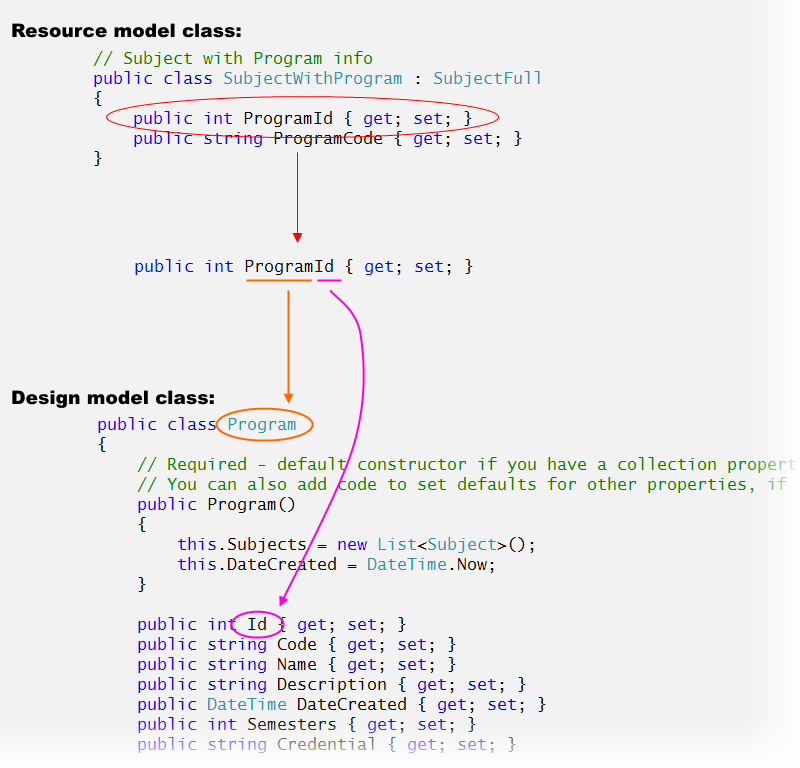 In a new resource model class, add a navigation property for the collection. The type is a resource model class type. The property name must match the property name in the design model class. You can see more in the AssociationsIntro code example. Look in the Artist_vm.cs source code file, and notice the ArtistWithAlbums class, which includes a IEnumerable<AlbumBase> collection property. This feature is ON by default in our projects. We can use it in combination with the existing convention based routing. In the AssociationsIntro code example, look for its usage in the Artists and Albums controllers. There are methods that enable a requestor to get an object (or collection) with or without the associated object(s). Recently, you learned about a Visual Studio project template that will help you learn web services. It includes a sample database with hundreds (thousands?) of data rows. The sample database holds data for a music business. It has artists, albums and tracks. It has customers, who have purchased music, so there are invoices and invoice details. Almost all entity classes have an identifier property, usually an integer. Its name is almost always “Id” or “<entity>Id”. For example, a Product class could have an identifier named “Id”, or “ProductId”. For new entity classes that we write, we recommend using the simple “Id” name. In our opinion, including the name of the entity class in the identity-property name is redundant; it adds no value. A resource model class for the Artist entity might be named “ArtistBase”. The generator / scaffolder / media formatter will assume that the identifier is “ArtistBaseId” – in other words, the class name, plus the “Id” suffix. However, the identifier is simply “ArtistId” (without the word “Base” inside). How can we fix this? 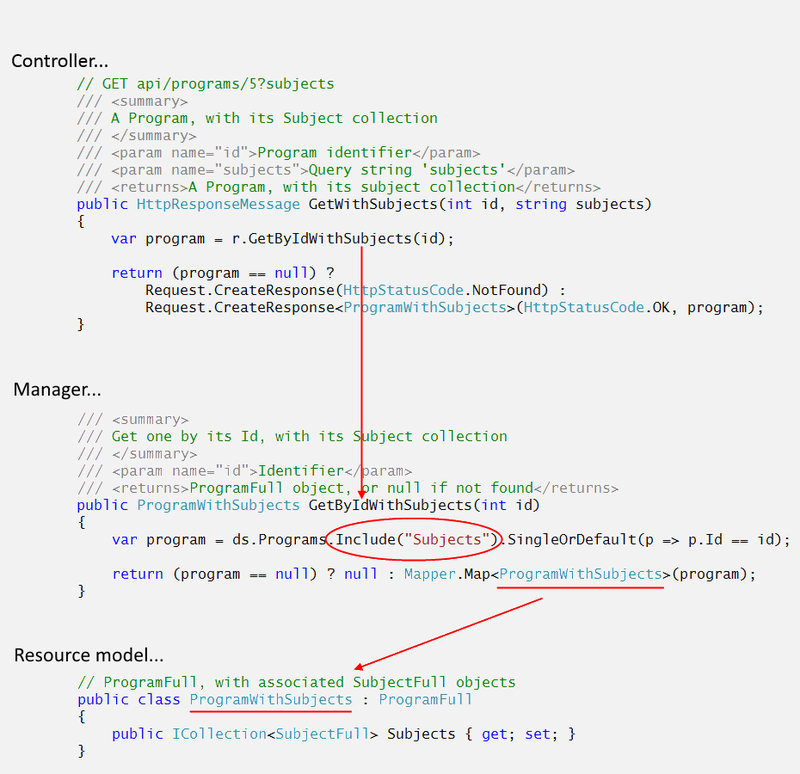 Use the [Key] data annotation, in resource model classes, for identifier properties.